Do it! Whatever you want to say say it, even if it has no relation to the post above! Let's make an off-topic thread in the off-topic subforum! I like to go to slumber parties in nothing but my underpants in a room full of homosexual guys. Then we tell eachother stories by candlelight. I herd you liek mudkipz. I disliked the weather today. You did a bad think? Does it affect me? No? Them Suffer in Silence. You Crying now? You have no reason to cry, if some one cries is because they are sad. For example,i cry because people are stupid what makes me sad. And i'm not insane, my Mother had me tested. by: "The Big Bang Theory -Sheldon Cooper"
Yesterday, I killed a pony by whacking kittens on its head. 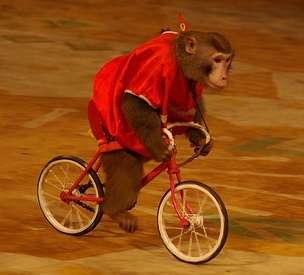 I don't know what's going on in this topic so I'll just paste a monkey on a bicycle.